Last Thursday I told the young people here in the church: there are so many of us on the hill and among us all there is a beautiful and great diversity. 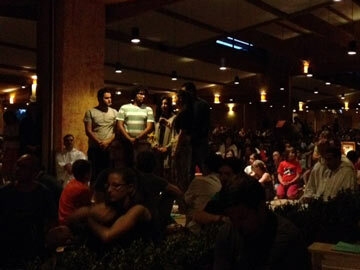 It is a constant surprise to see the joy and solidarity that unite those who are here. Our life all together allows us better to understand the communion of the Church. The Church is itself when, through the life of its members, it radiates God’s joy and peace. But at the same time we are distressed by what we learn of violence and wars in the world. The presence here of young people from regions marked by conflict makes us still more sensitive to the suffering. But their presence also encourages us tremendously. We see that everywhere there are women and men of peace. We are touched to welcome Ukrainians and Russians this week. And a group of Palestinians from the Bethlehem area. One of these Palestinians is Muslim; the others are Christians. And we also think of Rabbi Levi and our Jewish friends in Israel. This week two thousand French students were supposed to travel to the Holy Land and their project had to be canceled. We share their disappointment and that of those who were overjoyed to welcome them. 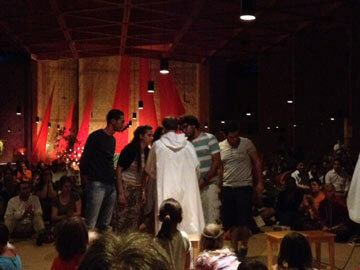 Some of these students have come to Taizé these days to replace this pilgrimage which was canceled. What can we do in the face of violence? When conflicts have erupted it is often too late. The spiral of hatred and revenge is extremely difficult to interrupt. The wounds are too deep for hearts to find peace. How can we open our eyes better in advance to the ways conflicts are prepared? I think of immigration, for example. Some want to protect themselves by building insulating walls. But they forget the debt that many Northern countries have to Southern countries, and they seem unaware that the North will need immigrants in the years to come. To prevent future conflicts, for example those that such situations prepare, it is essential to change the regulations. But this is not enough. To prevent conflicts, hearts need to change. Is not the priority today to introduce in human societies more brotherhood, more attentiveness to others? This implies in particular developing within ourselves a greater sensitivity to those who remain wounded by our roadsides. I would like this not only to remain a moral appeal, but for us to find in our faith a motivation for this call for solidarity. That will be the center of our thinking next year. Confidence in the infinite love that God has for each person, for each one of us, is the source of human solidarity. It is starting from this source of love that the Gospel invites Christians, together with those seeking peace, to a life of solidarity. For us brothers, one of our greatest desires is that all of you who pass through this place may discover this source of life. For this source to flow into our hearts, every person, and we brothers too, every person must clear the ground in themselves over and over again. This means not looking back, not clinging to bitterness or humiliation, but entrusting them to Christ, who has conquered hatred and violence. It is the Holy Spirit, present in us, who pours into our hearts the source of love and peace. In the face of all that discourages us—violence in the world, our own weakness and imperfections, and even our mistakes—in the face of all that we need to have the courage just to say yes to his presence. This yes can be hesitant and hardly noticeable, but it creates an opening in us. And peace received in the secret of our hearts can bring us far; it can transform the earth. Let us remember Mary’s yes. By her simple yes, that girl of Nazareth allowed Christ to be born among us. Surely none of her neighbors could suspect the extraordinary thing that was taking place. Let us say the same yes in order to receive the love and peace of Christ. By the presence of the Holy Spirit in us, he prepares us to forgive and to follow him to the point of loving even those who hurt us. Tonight we are praying especially for peace in the Middle East. Sometimes we wonder if prayer can change the course of history and it’s true that we do not know what effect it has. It’s better that way; otherwise our prayer might become a form of bargaining with God. We pray in the hope that our poor prayer may create openings and God’s love may more easily blow upon those we entrust to him. In this spirit, this summer we have been gathering every Sunday at 6:30pm for half an hour of silence in this church to pray for peace.